Explore custom foam die cutting, rubber die cutting, cork die cutting & sponge die cut services from our full array of quality die cut materials at Frank Lowe. Frank Lowe specializes in delivering custom die cut services from nonmetallic materials for a variety of industries and markets. Each meticulous cut is based on nearly 70 years of industry experience and our strong legacy of excellence. In addition to die cut services, we utilize our expertise to help our customers successfully solve tough challenges in the most efficient manner possible. We use state-of-the-art equipment to create precise die cuts based on your specific requirements. Even if you don't have specifications, we can still help. Simply tell us more about your application and your goals. We'll then provide guidance and help you choose the best type of material based on your specific application and budget. When you partner with Frank Lowe we will help you explore, pursue and create the perfect die cut solution. We understand the importance of die cut rubber components in your products, such as rubber seals and rubber gaskets. We offer a vast range of rubber elastomers, and we have an in-depth understanding of each material's characteristics. We'll work closely with you to first understand you application and then make sure you're using the best rubber elastomer to achieve the desired results. With our rubber die cut services, we never take shortcuts — we only make the right cuts. Explore, pursue, create with Frank Lowe's rubber die cut services. As a full-service manufacturing firm, we offer foam die cutting services as well as a full complement of quality foam elastomers. We will work closely with you to explore your needs and goals, help you pursue the best solution through cost-benefit analysis, and create the best possible foam die cut product. Our experts understand the unique characteristics of each foam elastomer and will match the best material to your application needs and goals. Explore, pursue, create with Frank Lowe's foam die cutting. Our die cut cork products are regularly used in arts and crafts. We can customize the material to virtually any shape or size. In addition to arts and crafts, our die cut cork is used in applications across all industries. Our cork material offers the ability to resist fluid absorption, maintain a tight seal, provide a long lifespan, and much more. Cork is also lightweight and extremely heat resistant. At Frank Lowe, we utilize quality composition cork and cork-n-rubber materials for die cutting. Explore, pursue, create with Frank Lowe's cork die cut services. 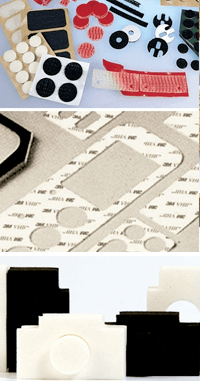 Our die cut sponge and die cut foam are both regularly used in the medical industry. Many of our customers also use our die cut sponge in gasketing, sealing, cushioning, absorbing, and for gap-filling purposes. Regardless of how you intend on using your die cut sponge, we have the expertise, equipment, and selection of elastomers to meet your needs and exceed your expectations. Explore, pursue, create with Frank Lowe's sponge die cutting services. Whether you need cork die cut services, sponge die cutting, rubber die cuts, or foam die cuts; the finished product will only be as good as the elastomer. Because of this, we never cut corners and always begin the process with quality materials. The specialized performance characteristics of our nonmetallic materials are engineered to ensure our protective and sealing solutions meet your needs and exceed your expectations. Most importantly, we will help you choose the material that is best suited to your unique needs. We also offer our die cut materials or elastomers in a vast range of colors, durometers, thicknesses, and choice of backing. When you partner with Frank Lowe for die cut services, you'll gain access to more than 60 years of quality production. As such, our experienced technicians and engineers understand all of the nuances associated with creating the perfect die cut for your application. Explore different die cut services and materials to create a new product or enhance an existing one. Pursue each potential option with cost-benefit and performance analysis. Create the die cut component that will offer the optimum performance while remaining within your budget constraints. Whether you know the exact specifications of your die cut or if you are just getting started, now is the perfect time to partner with Frank Lowe. Let's talk. We're ready to listen. Contact Frank Lowe today for customized die cut services.